A lack of rainfall and low streamflows have made it hard for the chum salmon to swim upstream, beginning with the first arrivals in October, said biologist Jon Oleyar, who monitors the streams for the Suquamish Tribe. As a result, some females have died before they can lay their eggs. jon expects lower productivity for this year’s salmon run — and fewer fish returning three and four years from now. Rainfall in Silverdale. Blue line shows current trend. “There are quite a few salmon stranded in the lower streams, which is really unusual to see at this time of year,” Jon told me. When the streams are running low, salmon can’t get to the upper tributaries of the major streams. Meanwhile, in the lower portions of the streams, female salmon are probably digging up salmon eggs laid by earlier females while searching for their own place to spawn. In the Chico Creek system, it appears that the peak of the chum run arrived last week, Jon said. Rains that came today are too late for many of the salmon, but ongoing light rains could still be helpful for late arrivals. On the other hand, heavy rains could cause high flows to wash out salmon eggs buried in the gravel,. Moderate rains would be best. Across the Kitsap Peninsula, rainfall was fairly close to average during October, but so far in November we remain well below average. For the water year, which begins Oct. 1, we are tracking some of the lowest rainfall patterns on record, looking at data collected by the Kitsap Public Utility District for nearly 30 years. As usual, the southern end of the county is receiving much more precipitation than the northern end. Rainfall in Holly. Blue line show current trend. 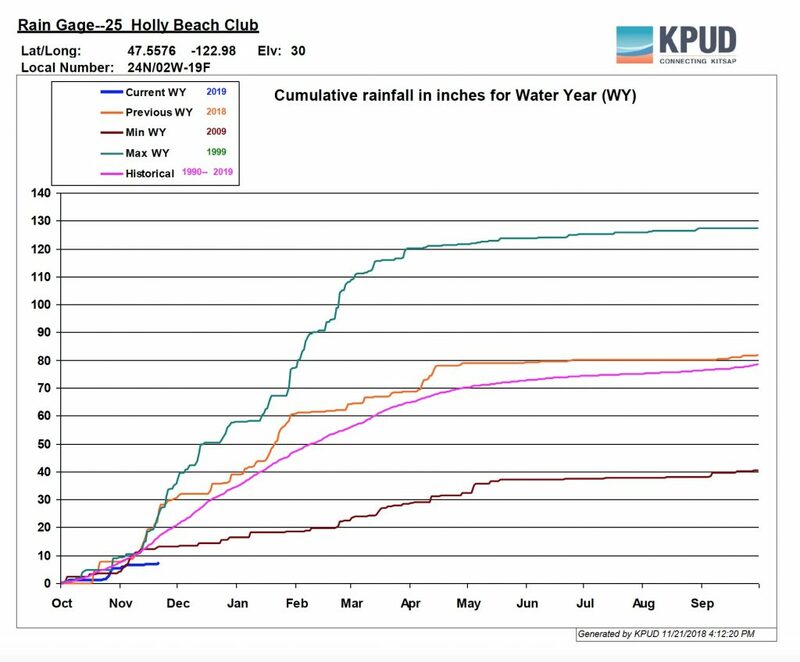 Hansville received 3.0 inches of rain in October, compared to a 26-year average of 2.9 inches for the month, according KPUD records. 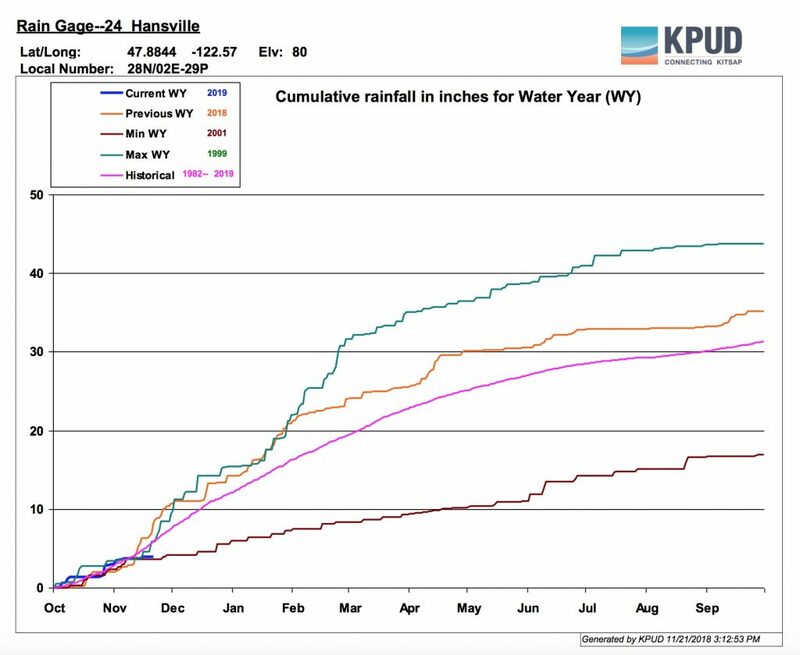 So far in November, Hansville has received just 1.0 inch, compared to an average of 4.5 inches for the entire month. It will take a lot of rain to make up that difference in the north end. 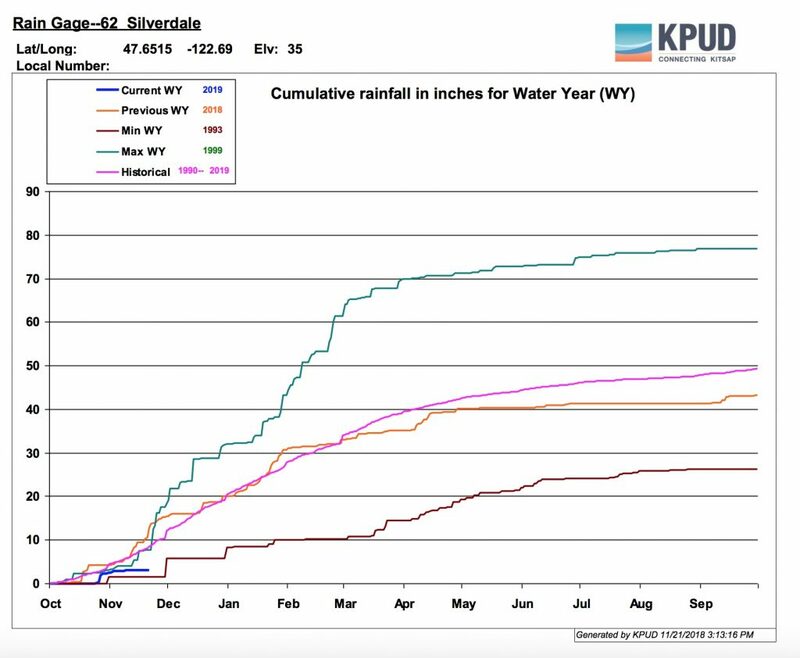 Silverdale, about midway, was somewhat under average in October, with 3.2 inches, compared to a long-term average of 4.4 inches. So far, November has produced just 0.7 inches — well below the monthly average of 7.7 inches, but we should have no trouble exceeding the record low for the month, which was just 0.9 inches recorded in November 1994. Holly, at the extreme southwest corner of the county, also was below normal in October, with 5.5 inches, compared to a long-term average of 7.5 inches. Again, November so far has been surprisingly low in the south end, with just 1.9 inches compared to an average of 13.7 inches for the month. A forecast announced this afternoon by the National Weather Service expects light rain to continue into tomorrow with the heaviest precipitation expected tomorrow afternoon, with scattered showers continuing into Friday and drying out by Saturday. “Wet unsettled” weather is expected next week. Jon Oleyar said the rains we saw today were really needed for those salmon still struggling to make it up the streams. It will take more water, however, to get them into the upper tributaries, since many of the little streams are nearly dry, he said. This may be a year when the only spawning is that which takes place in the larger streams. Wild salmon have adapted well to the region, Jon noted. They tend to arrive at various times throughout the fall, encouraged by rainfall and the scent of their home streams. No doubt some salmon are still waiting in saltwater, and they could enter freshwater with a little more flow. Jon said he has been hearing a lot lately about beaver dams, and many people are noticing salmon are getting stuck in great numbers as they try to go upstream. People want to help by breaking the dams and releasing some of the water, he noted, but that only creates a bigger problem for the fish. Thinking that the waters are rising, salmon may head upstream only to get stuck along the way when the waters drop back down. When streams are running high, salmon have their own ways over getting over or under the dams or even breaking through them. Beaver dams are part of the ecosystem, and salmon can find refuge in beaver ponds when the streamflows are too low for them to go upstream. Beaver ponds also provide excellent habitat for cutthroat trout and coho salmon, which spend their first entire year of life in freshwater and rely on such ponds during the low flows of summer and high flows of winter.